Map labels help to identify features, establish a visual hierarchy of important features, and focus the map user's attention on the purpose of the map. In this tutorial, you'll label suburbs in Wellington, New Zealand, as well as historic buildings that lie in a flood risk zone and local civil defense centers nearby. Adding labels makes it easier for a city planning group to identify important features on the map and make decisions for risk management. At the top of the dialog box, in the Search box, type Label your map tutorial and press Enter. In the list of search results, click Label your map to select the project package. The project opens with an Imagery basemap centered on Wellington, New Zealand. Boundaries of local neighborhoods and suburbs are drawn in yellow. Other layers in the Contents pane are turned off. You'll label the Suburb Boundaries layer so the suburb names display on the map. Labels for a layer are based on values in the layer's attribute table. 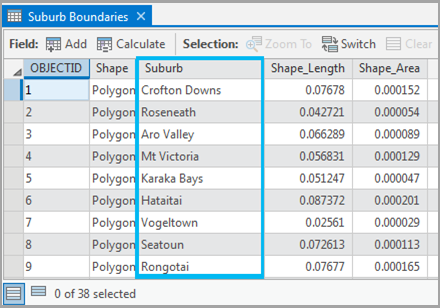 In the Contents pane, right-click the Surburb Boundaries layer and click Attribute Table . The attribute table opens. The Suburb field contains the values that will be used to label the suburbs. In the Contents pane, right-click the Suburb Boundaries layer and click Label . The suburbs are labeled with the names you saw in the table. However, the default text symbol makes the labels hard to see against the basemap. On the ribbon, the Feature Layer contextual tab appears. On the ribbon, under Feature Layer, click the Labeling tab. In the Text Symbol group, click the Text Symbol Style drop-down menu. Under Scheme 2, click the Populated Place (Capital) style. Now the labels are easy to see, but they overwhelm the map. On the Labeling tab, in the Label Placement group, click Land Parcel. Most of the labels disappear. The Land Parcel placement setting suppresses labels that don't fit completely within their feature. This condition changes as you zoom in and out on the map. ArcGIS Pro has two labeling engines: the default Maplex Label Engine, which is used in this map, and the Standard Label Engine. The Maplex Label Engine has more advanced label placement settings than the Standard Label Engine. You can access the label engine setting on the Labeling tab, in the Map group, from the More drop-down menu. For more information about the two label engines, see Label with the Maplex Label Engine and Label with the Standard Label Engine. Zoom in and out and pan the map. As you zoom in, more features are labeled. As you pan, the labels change position to stay in view. Labels may be more helpful at some scales than others. As you zoom in, labels for regional features grow less important and labels for local features become more important. By choosing the right map scale for label display, you help the map reader focus on the most important features of your map. You'll set a visibility range for the Suburb Boundaries labels so they don't display at very large (closeup) map scales. On the Labeling tab, in the Visibility Range group, click the input box next to In Beyond . Type 1:7,000 in the box and press Enter. On the ribbon, click the Map tab. In the Navigate group, click Bookmarks and click Te Aro. The map zooms in to the Te Aro neighborhood. Whether or not you see the labels depends on whether your map scale is larger (closer) than 1:7,000. The map scale is displayed in the lower left corner of the map view. If necessary, on the Map tab, in the Navigate group, click the Fixed Zoom In button one or more times until the labels disappear. When you zoom out beyond a scale of 1:7,000, the labels appear again. City planners may be concerned about damage to historic buildings in the event of a flood. The Building Footprints layer is already symbolized to show which buildings are historic. You'll zoom in to a small area that lies within the flood risk zone and label the historic buildings with their names. By default, all features in the layer are labeled. To label just the historic buildings, you'll build an SQL query. On the Map tab, in the Navigate group, click Bookmarks and click Historic Buildings 1. In the Contents pane, turn on the Building Footprints and Flood Risk Zone layers. In the Contents pane, click the Building Footprints layer to select it. On the ribbon, under Feature Layer, click the Labeling tab. On the Labeling tab, in the Layer group, click Label . The buildings are labeled. On the ribbon, in the Label Class group, you can see that the labels come from the Name field of the layer attribute table. You can label a layer either from the ribbon or from the layer's context menu. In the Contents pane, right-click the Building Footprints layer and click Attribute Table . In the table, right-click the Historic field name heading and click Sort Descending . Scroll down through the table and look at the values in the Name field (not the Historicfield) for the historic buildings. Most of the historic buildings have proper names. Others are called Building, House, or Warehouse. In the Contents pane, right-click the Building Footprints layer and click Labeling Properties . The Label Class pane opens. By default, labels are grouped in a label class. All labels in a class have the same properties, such as text symbol and placement settings. A layer can have more than one label class. Additional label classes allow you to define different properties for subsets of labels within a layer. To create a label class, on the Labeling tab, in the Label Class group, click the Class drop-down arrow and click Create label class. Alternatively, click the Menu button on the Label Class pane. In the Label Class pane, confirm that the Class tab is selected at the top of the pane. Under it, click the SQL query tab . Queries are used to work with features and table records of interest. In this case, you'll use the query to label only the historic buildings. Other buildings will not be labeled. Near the bottom of the Label Class pane, click Add Clause to start your query expression. In the clause builder, click the drop-down arrow next to OBJECTID and choose Historic. Make sure that the query condition is set to is equal to. Click the drop-down arrow in the empty box and click Yes for the value. Click Update to add the clause to the expression box. Click Apply at the bottom of the pane. On the map, only the historic buildings (symbolized in blue) are labeled. By default, all the historic buildings are labeled, even if labels are placed outside the features they belong to. You'll change some label properties and placement settings to make the labels easier to see and to make them fit within the buildings. Some of the labels will not display at all scales. In the Label Class pane, click the Position tab at the top of the pane. Under Position, click the Position tab if necessary. Change the Horizontal in polygon setting to Straight in polygon. On the map, the labels are oriented to the longest axis of their features. They now fit better within their features. 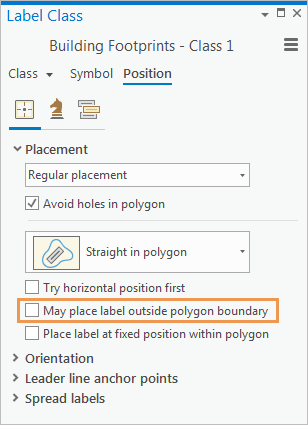 Uncheck the May place label outside polygon boundary box. On the ribbon, on the Labeling tab, in the Text Symbol group, change the text symbol font size to 8. Change the text symbol color to Arctic White. Your results may look slightly different. The white labels are easier to read. The smaller font size means that more labels fit completely inside the buildings. Pan around the neighborhood and look at some other historic buildings. Some buildings have long names and don't fit well within their features even at this large scale. You'll place some constraints on how far a label is allowed to extend beyond the boundary of its feature. Near the top of the Label Class pane, click the Fitting strategy tab . Expand Overrun and change the Maximum overrun to 5 points. Press Enter. Expand Reduce size and check the Reduce font size box. Under Font size reduction, change the Lower limit to 7.5 pts and press Enter. Under Font width compression, change the Lower limit to 95% and press Enter. The changes are applied to the map as you make them. Labels are now allowed to overrun their feature boundaries by no more than 5 points. Font size and compression will be adjusted slightly to make a label fit better. Labels will not be drawn if they don't fit within a feature under these constraints. On the ribbon, click the Map tab. In the Navigate group, click Bookmarks and click Historic Buildings 2. In this part of the neighborhood, you may see some historic buildings that aren't labeled. On the ribbon, under Feature Layer, click the Labeling tab. In the Map group, click View Unplaced . Unplaced labels are drawn in red on the map. Click View Unplaced again to turn off the display of unplaced labels. The Maplex Label Engine has many fitting strategies to help you place labels within features. For more information, see Why use additional strategies for placing labels? Click the Map tab and go to the Te Aro bookmark. At this smaller scale, your overrun setting prevents most or all of the building labels from drawing. However, depending on your map scale, some building labels may be visible. You'll set a visibility range to make sure all the labels turn off when you zoom out. You want the labels to draw at the scale of city blocks but not at the scale of neighborhoods. On the ribbon, under Feature Layer, click the Labeling tab. In the Visibility Range group, click the input box next to Out Beyond . Type 1:2,500 and press Enter. Any visible building labels turn off. They will display only when your map scale is 1:2,500 or larger. In the event of a flood, civil defense centers — typically schools or community centers — are important emergency shelters. You'll label the civil defense centers in the Wellington area. Click the Map tab and go to the Te Aro bookmark if necessary. In the Contents pane, turn on the Civil Defence Centres layer. On the map, click one of the purple dots representing civil defense centers. The Pop-up pane appears and displays the attributes of the feature you clicked. The labels for the civil defense centers will be based on the Site Name attribute. In the Contents pane, right-click the Civil Defence Centres layer and click Label . The labels display on the map, but they need different symbology. On the ribbon, under Feature Layer, click the Labeling tab. In the Text Symbol group, click the Text Symbol Style drop-down menu. Under Scheme 2, click the Populated Place style. In the Text Symbol group, change the Text Symbol Color to Amethyst. The labels are updated on the map. The placement of the labels relative to their features looks good, but you'll try some other options. On the ribbon, click the Map tab. Go to the Te Aro School bookmark. Confirm that the Civil Defence Centres layer is selected in the Contents pane. In the Label Class pane, click the Position tab in the top row of tabs if necessary. Click the Position tab under it and expand Placement. If the Label Class pane is not open, right-click the Civil Defence Centres layer in the Contents pane and click Labeling Properties . Change the placement from Best position to Bottom of point. The label is placed under the feature. Change the placement back to Best position. The Best position placement usually puts the label above and slightly to the right of the point. It uses other positions as needed to avoid conflicts with other labels or features. On the ribbon, click the Map tab and go to the Te Aro bookmark. Close the Label Class pane. You have labeled three layers on your map. You can keep experimenting with label properties to make improvements. For example, you can change the text color or halo size of the Suburb Boundaries layer to make its labels stand out more distinctly against the basemap. Alternatively, apply transparency to the basemap or use a more neutral basemap, such as Light Gray Canvas. You can use different text symbols and fonts for the labels in any of your layers.